Imagine yourself camping with your dog. That would be great and enjoyable experience for sure. Going on a camping is perfect if you need some time to have fun and relax with your best buddy. This will greatly strengthen your bond. Acquire a proper ID tags and dog license for your dog. Include in the ID tags your pet’s name, your name and address and phone number for safety purposes. Consider using a crate in travelling. Always bring plenty of water for your beloved dog. Bring also their food bowls, treats and some foods. To prevent problems, feed them on their normal schedule. Get their dog brush and chewing toys. Always bring their collar and leash. Never forget them, since they are very important if you want to keep your dog and others safe. This is best when camping with your dog. For unexpected events, bring first aid kit for you and for your dog. Always bring the phone number of a veterinarian in case of accidents. Make sure that the place you are going permits dog to be there. Otherwise problems might occur. Dogs are forbidden at many national parks. Try to research first before doing the camping. Give them time to rest. Do not play with your dog immediately. Give some time for your dog to adapt to the environment. This will prevent him to be confused. Monitor your dog all the time. Keep an eye at your dog and don’t let him go somewhere else. Be sure that your dog is having fun. You can play with him such as making him fetch a ball. Prepare immediately your tent. This will be helpful, especially when it suddenly rains. Make your dog calm and control him whenever something or someone attracts his attention. Prevent him from making himself injured or someone injured. 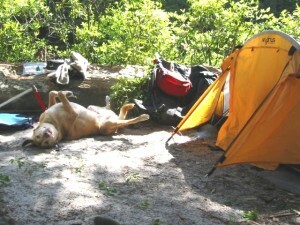 These camping with your dog tips will provide you with a safe, fun and enjoyable camping experience. This is all worth the effort. If you enjoy taking your dog camping with you, then you should invest in a dog pack for him. Not only are backpacks for dogs great for camping, they are also perfect training aids and used as a means of exercise.